Census tracts are sub-county areas of 8,000 or fewer inhabitants. Census tract data enables the user to survey local differences in poverty rates, income levels, ethnic characteristics, education levels, and other characteristics for sub-county geographic areas. 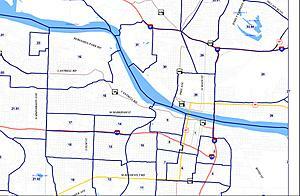 The image at left is a sample map of census tracts in and near downtown Little Rock-North Little Rock. Census tract maps for the six counties in central Arkansas can be found below. For census tract data, visit the Census area under the Data Center section of this site. Zoom in and scroll as necessary to view tract boundaries. Note that changes from 2000 to 2010 included not just tract splits but, for the first time, consolidations.